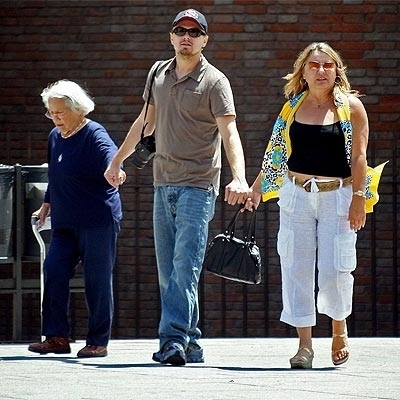 Leo with grandma' and mom Irmelin DiCaprio. . Wallpaper and background images in the Leonardo DiCaprio club tagged: leonardo dicaprio image leonardo dicaprio actor. This Leonardo DiCaprio photo contains सड़क, शहर के दृश्य, शहरी सेटिंग, शहर दृश्य, and शहरी की स्थापना. There might also be बिजनेस सूट, workwear, वर्कवेअर, लंबी पतलून, लंबे पैंट, लंबे पतलून, and लंबी पैंट. It's interesting to see his mom and grandma!